I am not sure where I picked up this little honey of an edition, but it has been sitting in my TBR for quite some time. In the world of Trollope, this almost 300-page book is practically a short story and it is full of all of the clerical intrigue that one comes to expect from this Victorian master. If the opera Aida could have just as appropriately been called Amneris after the mezzo-soprano role (or if Barber’s opera Vanessa could have been called Erica after that mezzo role), so too could Dr. Wortle’s School have been called Mr. Peacocke’s Secret. It is, after all, the revelation of Mr. and Mrs. Peacocke’s secret that put Dr. Wortle and his school to the test. The Peacocke’s have come to work at Bowick School and soon become indispensible to its success, but it turns out they are hiding something. Early in the novel Trollope lets us in on the secret so I will not feel bad about revealing said secret here. But I guess I should officially issue a spoiler alert, although I don’t think knowing the secret will lessen the interest of anyone wishing to read this book in the first place. While teaching classics at a university in the USA Mr. Peacocke marries Mrs. Peacocke thinking that her abusive, drunkard, deserter husband has been killed, thus freeing her to remarry. Sometime after they are married Mrs. Peacocke’s husband reappears very much alive. So, rather than put her back in the hands of the abusive husband, the Peacockes move to England and take positions at Bowick. Well you can imagine what the society folks of 1882 think of the Peacockes once the secret gets out. 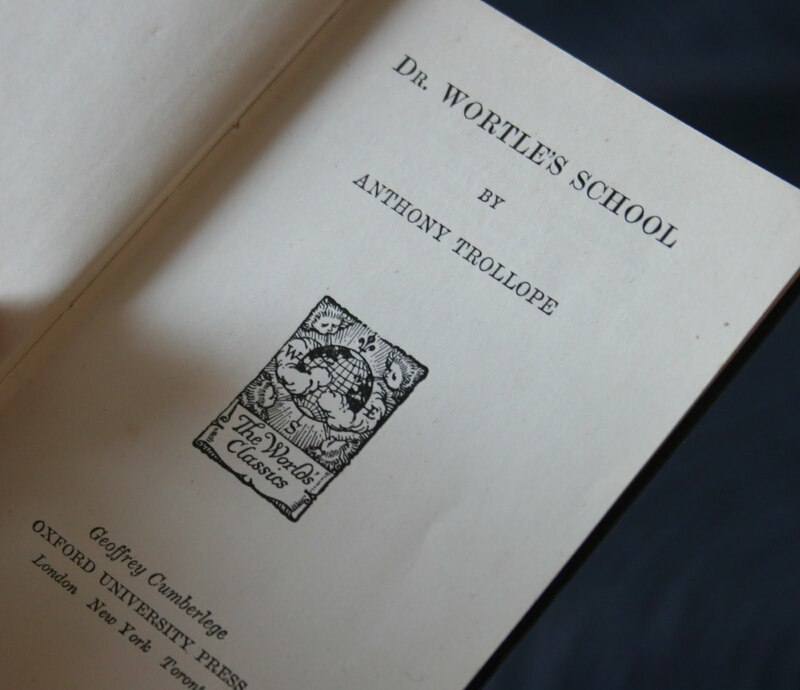 Even worse is that Dr. Wortle decides to defend the couple, putting the reputation of his school and its very existence on the line. What I won’t tell you is if Dr. Wortle’s school or his soul are saved. This isn’t the most fantastic Trollope of all time, but it might be a good intro for someone who has never read any of his prodigious output. It certainly provides a cozy read and a forward momentum that makes it a bit of a page turner. And the rather racy nature of the secret, at least by Victorian standards, makes it a little more risque than one normally expects from Trollope. If you enjoyed the clerical intrigue please read Susan Howatch – any of her books. I've done a review on my blog of one of her books but they are all very good. Hannah: Well if you like Trollope you should like this one. Mystica: I have never read Susan Howatch, I will have to look out for her. This was my first Trollope – almost 20 years ago – and I found it cosy and rambling. At the time that seemed like a bad thing, but as I get older I feel more attracted to Trollope's style. My favourite Trollope anedote (which you may already know) concerns two gentlemen that he overheard in his club, discussing how many they hated a particular female character in a story of his that was being serialised. Steerforth: I choose to believe the story. Although, how in the world did he have time to spend at his club? Regardless of how good a piece of Trollope's writing the book is (and I have no complaints on this score), it is a masterly – and ageless – attack on the hypocrisy of “polite society”. This book also has something to say about sin, and about formal religion or religiosity, which is as relevant today as it was in 1881. All in all a wonderful “short story” (as Trollope himself describes it), and well worth reading.